While Western Washington's state highways have mostly returned to normal from the two-week winter blast, the snow just hasn't stopped in Eastern Washington. Close to 60 inches has fallen in the Spokane area, and most of it has not melted. WSDOT regularly shifts resources around areas and regions. A good weather window in Western Washington allowed us to shift plows to Eastern Region for the next five days. We are shifting five plow trucks and 10 drivers from Olympic Region (two from Aberdeen and three from Tacoma) to Eastern Region to help with the snow removal efforts over there. The Olympic Region crews will be working for Eastern Region Area 1 Superintendent Gary Clemenson in Spokane. Two trucks left from Tumwater last night for the Spokane area. Three more left this morning from Tacoma. On one level, moving trucks and drivers from one location to another around the state seems like it should be relatively straightforward. However, there are lots of details necessary to pull it off successfully. Just a few include outfitting the trucks, getting the drivers, changing out plow bits, adjusting the radio frequency, working out the details of who would meet them and where they would go once they got to Spokane. There were a host of other details. Here are some photos of crews switching out the OR's rubber plow bits for steel bits to use in Eastern Region. A quick tidbit...we use rubber plow bits in most parts of Western Washington to protect raised pavement markers. They use recessed pavement markers in most parts of Eastern Washington. What is a snow ostrich? When a big storm hits, drivers get frustrated. They are frustrated they can’t go where they want, when they want. They turn to the Web and start sending angry E-mails. So…. I thought it might be a great moment for a quick civics refresher. The State Department of Transportation (WSDOT) is responsible for state highways and interstates like SR 522, SR 18, I-405, SR 520, I-5. Anything with the words highway, state route, or “I” as in I-5 are within WSDOT’s jurisdiction. These are the roads we maintain, clear, build etc. When a state highway runs through a large city (population 22,500 or more) it becomes the city’s responsibility. For example, Highway 99 runs through the city of Shoreline so the city of Shoreline is responsible for clearing snow on Highway (Aurora Avenue) inside the city limits. Counties are responsible for roads outside city limits. For example, all the roads near Highway 203, Highway 202 and Highway 18 that are NOT inside the cities of Carnation, Duvall and Maple Valley are King County’s (KCDOT) roads to clear. Finally, cities are responsible for clearing all roads inside the city limits. For example, Seattle (SDOT) is responsible for clearing and maintaining roads in Ballard, Fremont, Magnolia etc. So where does the snow ostrich come in? Last week, we got an email from an irate driver who accused us of putting our heads in the sand when it came to snow removal. He said, “Don’t be a snow ostrich!” His frustration was directed at another agency, but he mistakenly emailed us. Either way - we loved the idea of a snow ostrich so we decided to adopt that as our new winter mascot. We want to make sure NO ONE is a snow ostrich. We want every driver to be prepared for snow and weather. One of our graphics folks drew this. Print it and put in on your fridge as a reminder to be prepared, check for conditions and plan ahead before you head out. As for the email, we do read every single one and respond to every single one (good and bad). It's part of Gov. Gregoire and Secretary Hammond's commitment to the citizens of Washington State. So keep em coming! When you see clear roads in the mountain passes and on the highways during the holidays, think of Dennis Keeler. Keeler has worked for the Washington State Department of Transportation for 26 years – most of those plowing a path on I-90 through Snoqualmie Pass. He and hundreds like him work hard 12-hour shifts in the cold and wind clearing the region's roads for holiday travelers. More often than not, that includes working a long shift on Christmas. “It’s something you really don’t want to do, but it’s part of the job,” said Keeler, a maintenance technician. “I figure if I work, maybe everybody else can have Christmas dinner with their kids and their families. I’ve done it for 26 years. Keeler figures he’s worked on Thanksgiving and Christmas during 20 of his 26 years with the state. Keeler’s five kids – four sons and one daughter – are grown. Keeler also has five grandchildren and two great-grandchildren. After nearly two weeks of snow storms in the Puget Sound area, WSDOT’s snow plows are a familiar and often welcome sight. Keeler said he’s been getting more thumbs up and honks of appreciation than usual. Even so, we’re all waiting for the winter weather to warm up. “It gets old, but we keep on pluggin’,” Keeler said. To see photos of what it's like from the driver's seat of a snowplow, check out our Flickr site. Hey, WSDOT, You put a snow bank in my driveway! We’re being inundated with calls this morning about personal driveways. Folks who live on our state highways are calling and asking us to clear the berm we’ve created as we cleared snow from the road. In the last two hours, I personally have taken calls from a mom with a new baby and three small kids in Carnation and an elderly couple for whom the need for immediate medical attention is a real possibility. We know it’s hard especially after seven straight days of this stuff. You might want to consider calling a neighbor and asking them to help you out. Another idea - if you are reading this and you are healthy and looking for something to do, you might want to go knock on a neighbor’s door and offer your services. (I know I shove my teenager out the door to check on our neighbors at times like this.) It is the holidays, after all, and a good deed would certainly be appreciated. 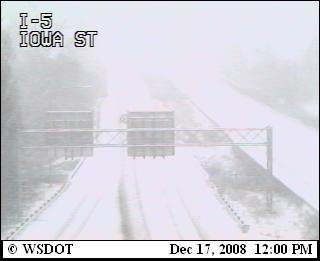 The good news: I just took a tour of the traffic cameras and it appears the snow is turning to rain in the Northwest. YEAH!!!! So perhaps an end is in sight. If you need assistance, you can call 211. It's the Washington information network and an operator can connect you with health and human service providers: www.win211.org/ . I keep hearing on the news- “prepare for winter driving” and “drive for conditions,” and I would if somebody would tell me what that means. If this is a thought you’ve been having - let me see if I can help. What winter driving means to me is- slipping and sliding and skidding if I try to drive the speed limit. It can also mean a fender bender, a towing bill, a ticket, and a trip to the hospital if I don’t drive differently than I did all spring, summer and fall. Driving on the cold, dry snow has been relatively easy. I have found that if I just go slower (ten to fifteen miles per hour slower), and push gently on my brakes when I need to stop and gently on the gas when I need to go, I can get anywhere I want to go without getting into trouble. Driving in slush is a whole new ball game. Slush is not only slippery, it’s grabby. It suddenly slows the car down, makes a big splash, and can make changing lanes scary. And if I happen to drift onto the shoulder a little it will pull me right into the ditch before I can say oh ____! Plus the big rigs with big tires- like semis- throw that stuff up onto my windshield and cover my side windows making it very hard to see out the sides of my car. After I cross the pass, I often have to stop at the nearest car wash to clean the windows off before I can safely get back on the road. When the sun goes down and it gets below freezing- that lousy pile of slush on the side of the road- or in front of my driveway- turns to ice. Now I have a new “driving for conditions” challenge. When the slush turns to ice, I opt to just stay home until it changes into something else. I think I like the dry powdery stuff best. As far as being prepared- that means digging through all the stuff in the garage to find the chains, making sure they fit the car I’m driving now and replacing the old, dried out, noisy windshield wipers that clear most of the windshield except for that little spot right in front of me. You know the spot- the one that ices up and the wiper won’t clear until I roll down the window and reach out into the cold, catch the blade while it’s wiping (long arms make this possible) and pull it away from the glass a few times until it pops all of the snow and ice off. I also take a winter coat, hat, gloves, jumper cables, a flash light and reflectors so I can stay warm if I have to put the chains on or I have to wait while the people who didn’t prepare and didn’t drive for conditions get straightened out or towed out of the way. Drivers can take comfort when they know WSDOT plows are hitting the road at the first sign of snow. The plow drivers can take comfort as well, because they know they have great mechanics backing them up and making sure their equipment is safe and ready for a long day or night of work. In Mount Vernon, the Area 2 equipment maintenance crew is down to two techs. Normally there would be three techs to take care of the multitude of trucks and equipment necessary to keep over 324 miles of highway safe (802 lane miles). But one mechanic has been out after an injury, leaving Tim McCartney and Andy McKinney to pull some extra duty to keep the trucks on the road. Tim, a Tech 4, has been with WSDOT for 23 years. His teammate Andy, is a Tech 3, and has been with WSDOT for five years. Mechanics Tim McCartney (left) and Andy McKinney work on a hydraulic pump used to position a plow blade. All week, Area 2 plow crews were humming like a well oiled machine. During our first blast of winter, they had 16 trucks sanding, deicing and plowing 24/7 from Whidbey Island to Marblemount, and everywhere in between. That meant the equipment maintenance crew was burning the midnight oil too. Even though snow removal equipment is built tough, winter can wreak havoc on not just the trucks, but the pumps, motors and electrical equipment that all have to work together in extreme weather conditions. Along with regular maintenance and adjustments, they had several breakdowns last weekend too. That meant the two of them pulled extra-long shifts to keep the trucks rolling. Please use common sense and be careful about when and where you choose to remove your tire chains. If you're headed for the highway, there is a good chance that it is going to be bare and wet. We've hit the highways hard with sand, salt and plows. They're looking pretty good right now. Chains don't work on bare and wet pavement. It's not a good idea to try and remove your chains from the side of the highway. Please plan ahead and remove your chains before you get onto the highway. If you get on the highway with your chains on and need to remove them, please wait until the next exit or find a safe location to do so. Please don't do it on the highway; it's just not safe. A person was hit today while removing their chains and we don't want it to happen to you. We know it's not an easy thing to do when the sides of the road are completely covered with snow, but please be sure to pull all the way out of the lanes of travel to remove your chains. When the snow starts to fall steadily, our plow drivers switch into a mode we call gang plowing. A team of plows will each take a lane on a wide freeway like I-5 or I-405 or I-90 and stagger themselves. Each drives a little farther back than the driver in front and works one lane over. We posted pictures of gang plowing on our Flickr picture page as well as video on YouTube. Driving in tandem like this requires tremendous concentration. Our drivers tell us it makes them crazy when drivers either: drive too closely to the plow or try to split the plows to somehow get ahead of them. Up on the Snoqualmie Pass, drivers up there tell us it's not uncommon to see someone split the plows and then get a windshield full of snow. This, of course, causes a driver to become disoriented and then, believe it or not, their first instinct is to drive into the snow plow! Talk about dangerous. Our plows are a lot bigger than your car or truck. So, please, we are doing our best to keep the roads clear. The road behind our plow is so much nicer than the road ahead of it. Our plows will split up and let drivers get by after a mile or two. Give them the right of way. We're just trying to make your trip a little safer. In early December the AAA Foundation released the results of an in-house study on cell phones and driving. An astounding two-thirds of Americans who use cell phones while driving believe it is safer to talk on a hands-free cell phone than on a hand-held device, despite scientific research showing that is simply not the case. In fact, evidence shows that using a hands-free phone while driving impairs your reaction time to critical events and increases your crash risk about the same as if you were using a hand-held phone. Too many Americans are driving with the false sense of security that hands-free devices are somehow safer. This misconception is posing a risk to all road users, because using a cell phone while driving makes you four times as likely to be involved in a crash. Too many drivers are chatting away on their hands-free device or their Bluetooth with no knowledge of the danger and they’re putting us all at risk. Drivers need to be aware of the dangers of distracted driving and pay full attention while they are behind the wheel. Young drivers, especially, face an array of potentially deadly challenges behind the wheel. Parents should ensure cell phone use while driving, whether hands-free or not, isn’t added to the list of distractions at this critical time for new drivers. I just saw the dozers clearing the field for the Seahawks and hope the fans keep warm. More snow is on the way and Gov. Gregoire has asked us all to stay off the road if possible. We do have a few cameras offline in the Seattle area - I hear it's due to frozen fiber optic cables. If that is the case, that's not something we can fix soon. Have to say the snow falling right now in Olympia is absolutely beautiful - the big, fluffy flakes. It's unfortunate it creates such a driving hazard. Please be prepared and take it easy out there. We will be updating this blog and our Twitter account all day. Stay tuned. 11:45 p.m. update: they just extended the I-90 Snoqualmie Pass closure from milepost 33 to milepost 106 (North Bend to Ellensburg). The Snoqualmie Traffic Management Center is now telling me westbound travelers may think about I-82 to Yakima and west on US 12 over White Pass. Or, north on US 97 to US 2 over Stevens Pass. Both Stevens and White have traction requirements. The wind and snow has taken its toll on the mountain pass highways and Columbia Gorge. We have just closed Snoqualmie Pass. The crew at the top told me you just can't see. And the same down on SR 14 through the Columbia River Gorge. Oregon has also closed I-84 through the Gorge on their side. We are also getting our first reports of freezing rain. With the snow and ice already on the road, freezing rain can be the most difficult to clear. It just freezes on contact to whatever it touches. If you can , stay off the roads. If you do have to drive, be prepared for hazardous driving conditions. Jeremy has all the links in his post below. Please be safe. Know before you go. We activated the Emergency Operations Center (EOC) in Olympia this morning as just one of the many steps we are taking to be prepared for this weekend's storm events. We are reporting travel alerts and road conditions for much of the state as it rolls in. 3. Twitter users are posting current condition reports by tagging their posts with #seatst. Stay home if you can. If you must go anywhere be prepared before you go, blizzard-like conditions have been forecasted. Winter storm warnings in affect for most of the state. Very high winds expected in Puget Sound area. If there ever was a great day to stay home, this is it. Icy conditions have been reported all around the state. Many roads were closed yesterday due snow caused spinouts and accidents. So far this morning we aren't seeing road closures due to accidents because many of you are choosing to stay home. Besides having all available crews out making the roads passable, we are starting to turn our attention to staffing plans for this weekend. Forecasting models are a bit varied as to what could happen. We are hearing differing versions from various sources. It might be windy, there might be a lot of snow, stay tuned to the forecast, if we learned anything this week it's that weather is very unpredictable. We found the source of the Web site problem. Turns out we only had half the available bandwidth we should have had. Technicians were working on it yesterday afternoon and it shouldn't be a problem today. Just for comparison we normally have about 800,000 page views a day, Wednesday we had 5.8 million and yesterday we had 6.1 million page views, and not all the requests to our Web site made it to our servers. We have heard many requests from you to find out road conditions in very specific places in the state. I am going to be completely honest with you and tell you that I am nervous to tell you those conditions. The weather has been changing so rapidly and icy conditions have been reported almost everywhere, that if I tell you something it may be different than what you experience once you drive out there. I would just recommend you stay home today. If you have to go out, take it very slow and give plenty of room to drivers around you. We will continue to keep you posted via this blog and Twitter all day if we hear more. Chains still required on Snoqualmie pass. All other passes have traction tire requirements, but I would suggest you have chains in your car just in case. All lanes of I-5 Southbound are closed due to a multi-vehicle collision involving several semis and passenger cars at Maytown Rd. milepost 94. Expect periods of snow to continue through 2 p.m. or 3 p.m with 1-3 inches expected in Seattle / 2-4 inches in Bellevue. Temperatures will hover around 30 degrees this afternoon. A large snow squall is moving though the I-5 Grand Mound area. It should pass in about an hour. For tonight -the skies will clear up and temperatures will fall to 18 degrees. The Cascades will experience snow squalls throughout the afternoon and evening - the worst weather should occur between 10 p.m. and 2 a.m.
WSDOT Commercial Vehicle Services has restricted oversize vehicle movements in Western Washington due to the inclement weather. Westbound SR 520 at W Lake Sammamish Parkway is now open. The following ramps to westbound SR 520 are still closed: SR 202, Union Hill and West Lake Sammamish Parkway. All lanes of northbound I-405 at Coal Creek Parkway near Bellevue are now open. An earlier disabled semi-truck blocked the left two lanes. The semi has now been cleared. SR 599 is closed at East Marginal Way. We are taking traffic off at SR 99 there. It's very very snowy. The latest road report from Whatcom County still shows compact snow and ice on most major routes. From Burlington to Ferndale, I-5 has compact snow and ice. North of Ferndale, I-5 is slushy, with bare wheel tracks to the pavement in most areas. Some roads have improved: SR 543, the truck crossing, is mostly bare and wet, as is SR 546 (Badger Road) north of Lynden and SR 548 (Grandview Road) northwest of Ferndale. All state highways in Spokane, Whitman, Lincoln, Adams, Ferry, Stevens, and Pend Oreille County have compact snow and ice, or loose snow on the roadway surface. Over the next 24 hours, there is a possibility that the winds may increase across Eastern Washington. If this occurs, there could be blowing and drifting snow in many areas, especially in Adams, Lincoln, Spokane, and Whitman counties. These conditions could require the WSDOT close some highway sections until the wind subsides and the roadways can be cleared. I will post more as I hear more. Will also continue to post updates on the Twitter account. Our site is running really slow, but it isn't something that is showing up on our monitors. Our network is only at half utilization, the servers are at normal use, we are looking into it and hopefully can get it fixed. We are as frustrated as you are, trust me. Chains required on both directions of Snoqualmie pass. Traction tires everywhere else. This could change moment by moment. Passes are fickle that way. Northbound between SR 169 and I-90 has been very difficult all morning. Nearly a parking lot. Hazardous road conditions all along this route. Westbound SR 520 remains closed due to multiple spin-outs and dangerous driving conditions. The closure begins at the Union Hill on-ramp to westbound SR 520 to West Lake Sammamish Parkway. The following ramps to westbound SR 520 are closed: SR 202, Union Hill and West Lake Sammamish Parkway. Northbound near Boeing field has been rough going all morning. The I-5 northbound ramp to the Boeing Access Road has been closed due to poor weather and icy conditions. Seattle area weather update - 10:15 a.m. This storm has become stationary over the Seattle area. We could see as much as 6 additional inches of snow (this includes downtown Seattle). This will last though and beyond the morning commute. The temperatures are scheduled to drop as an arctic front. Icing is a major concern for the morning commute. It continues to snow in much of Whatcom County. Crews on the roads report compact snow and ice everywhere, and blowing, drifting snow in the eastern part of the county. Chains are required on Mount Baker Highway east of milepost 39 (East Church Mountain Road). Our crews have every piece of equipment they own out on the roads, and they're doing their best to keep the roads passable. Hearing reports of 18-20 inches of snow, conditions are bad all around. Expecting more snow today. We reached 5.8 million page views yesterday. A new record for our site. Unfortunately we are experiencing internal network issues this morning. Pages may be slow to load or may not come up at all. We will be updating this blog, Twitter, and posting photos all day today to keep you informed of the conditions. If you can stay home today, do it. If you find yourself on the road and you do not want to travel any farther, consider getting off the freeway entirely or move to the right side. Please do not stop in the travel lanes or on the left shoulder. It prevents our road crews from getting through and it prevents emergency vehicles from accessing true emergencies. They need that left lane. Thank you for your continued help and patience. We are working as quickly as we can to get our roads in good condition. Seattle got a direct hit of winter weather just as the commute was getting going this morning. All routes into Seattle are congested. People are getting out of their vehicles on 520 and driving backwards to get off the freeway. Those coming in from Federal Way may have had no idea things were this bad in the metro area - they just didn't see this weather when they left home. Vancouver is also getting its first taste of winter in the metro area. Our Web site also hit a million page views by 7 a.m. this morning - this could cause some slowdowns for users. If this continues we will switch to a more basic site. Most of Eastern Washington is compact snow and ice. Those taking this day off to go skiing - be ready for snow and ice. Do not drive against traffic on the freeway. Do not abandon your vehicle because we can't clear the road if you aren't there to move your car. Please check your entire route before you leave. As you can see from Dustin's post - they are getting hit hard in the North Sound and it's moving south. It's been coming down hard in Olympia this morning and I hear from some friends down south that Centralia/Chehalis has snow and ice. And it's moving further south into Cowlitz and Clark counties. Spokane is also getting hit hard. And it's going to be that way for a while. Snow and ice could come to the Seattle metro area later this afternoon. And the mountain passes could see two feet or more tonight. Bring chains. If you are going out today, expect winter driving conditions. It doesn't matter where you are or where you are going. You will see snow and ice somewhere. Slow down. Our crews are out treating, plowing, clearing. And we are watching the forecasts very close. Think twice before you head to Skagit, Whatcom and Island counties today. We're having whiteout conditions randomly throughout the counties. Just about every road in Skagit County has compact snow and ice. The same goes for many of the roads in Whatcom and Island counties. My coworker recently measured the snowfall on his car in the parking lot, and since 7 a.m. this morning we've gotten 3 inches of snow in Burlington. I've watched as the cops and tow trucks have responded to several collisions right in front of my office. If you don't have to leave the house, it's better that you don't. I'm watching on the Bellingham traffic cameras as our crews respond to an overturned semitruck on I-5 in Bellingham. http://www.wsdot.wa.gov/Traffic/Bellingham/I5_LakewayDr.htm. We're shifting five additional snowplow trucks up to the Skagit, Whatcom and Island areas to help fight the snow. When I asked my my maintenance supervisor what he wanted me to tell the radio stations, he said, "STAY HOME!" Our plow drivers have a hard time plowing and sanding the roads when they're clogged with collisions. As temperatures across the state plunge to what seem like arctic levels, maintenance crews are faced with some unique challenges in their quest to keep the roads drivable. On SR 20, just east of Newhalem, crews battle giant icicles. Seriously. If you drive SR 20 during the summer, you may not think much of the water that seeps through the rock as you pass through the tunnels east of Newhalem. But in the winter, when the weather drops below freezing, that water can become a hazard for drivers. 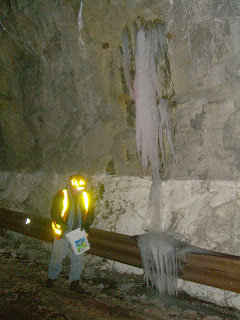 The icicles that form on the walls and ceiling can get so large that they nearly impede traffic. And the constant dripping of water onto the road creates several icy patches. Our maintenance crews are up in the area several times a week during cold weather, making sure the icicles don’t grow too large and placing deicer and sand on the road to keep it safe for drivers. In 2006, the AAA Foundation for Traffic Safety made safety culture one of four long-term research and education focus areas. The goal was to get behind the statistics and figure out why people behaved the way they do on the road, what fuels those actions, and most importantly, what could be done to change the situation. Despite the effort of a dedicated traffic safety community, what we generally saw was that motorists, elected officials, and society as a whole had become extremely complacent toward the staggering roadway death toll. While the numbers of deaths should have caused red flags to be waved demanding action, instead it appears we have been waving the white flag of surrender, tacitly accepting these preventable deaths as the cost of the mobility we enjoy. In light of this, the Foundation published its first-annual, Traffic Safety Culture Index in 2008, a nationwide survey analyzing the beliefs, attitudes, and actions of motorists and non-motorists alike across the country. I referenced some of the findings in an earlier post. The results were both alarming and telling. Motorists condone the very actions that they abhor, demonstrating a “do as I say, not as I do” culture. For instance, over 80 percent of respondents rated distracted driving as a serious problem, yet over half admitted to talking on a cell phone while driving in the past month. Three in four drivers rated speeding as a serious problem, but 40 percent of those same drivers admitted to driving at least 15 mph over the speed limit on highways. And if that wasn’t enough, three in four respondents claimed to be “more careful than others” behind the wheel. However, at the same time, over 60 percent of the respondents rated road safety as a serious national problem — admittedly below gas prices, but ahead of global warming. This is an encouraging number for the traffic safety community, and one that hints of added support for tackling this epidemic. Organizations such as the U.S. Department of Transportation, the Centers for Disease Control, and the Transportation Research Board, in conjunction with the American Association of State Highway and Transportation Officials, have published comprehensive guidance and reference materials documenting dozens of known countermeasures. Most traffic safety professionals believe that deaths and serious injuries could be reduced by as much as 50 percent if known solutions were implemented. In the Foundation’s Index, only 33 percent of respondents believed the government could substantially improve traffic safety. And, although it is difficult to identify exactly why people felt that way, it is safe to assume that part of the reason is due to years of “over promising and under producing” by government agencies. They have promised congestion relief, but none has occurred, and they have promised enhanced traffic safety, but we’ve seen little substantive change in deaths and serious injuries over the last decade. However, with new emphasis on enhanced communications, collaborations, and a reinvigorated culture, the vision of safer drivers, in safer vehicles, on safety roads could become a reality. Everybody ready for a wild weekend? It looks like it's going to be a fun one, if you like storms that is. Personally, I happen to love them, but then again I don't have any Christmas shopping to do this weekend. It's dumping in the passes today, with up to 2 feet of snow expected in some areas. If you have to travel over the passes this weekend I highly recommend you take the time to get prepared before you go. The road conditions are changing very quickly. One of the most vital pieces of information you can have before you travel over the passes is the reports that tell you the current conditions and let you know if you need to put your chains on or not. We have several different ways to get this information and I wanted to let you know about all of them, especially before this weekend. You can sign up to get the reports directly to your inbox as conditions change. A word of warning though: on days like today that can mean a lot of messages in your inbox. But, it can be very beneficial to know what the current conditions are and how quickly and often conditions change up there. Put the RSS feed of your favorite pass in your RSS reader to stay up to date. There is a link on each mountain pass page to it's RSS feed. Don't forget you can always dial "511" and get the latest conditions. We have a new tool in the arsenal by using Twitter. You can get current pass conditions by direct messaging the WSDOT twitter account. Set yourself up with a free twitter account, and by using the specific keywords and instruction provided on this page, you can send a text to the WSDOT account and it will reply back to you with the current conditions. That means if you are about to drive over the passes and you send a text message (of course not while driving) to Twitter (40404) with the words "d wsdot pass sno" Twitter will text back to you the current conditions of Snoqualmie Pass by using Twitter's direct messaging feature. Twitter is the only way we offer pass reports via text message as of right now. We are working on a way that would allow a system to send you a message whenever the pass report updates, but we are still working the bugs out of it. Limiting these messages to 140 characters is proving to be a challenge. Stay warm this weekend, take the time to get prepared, and drive safely out there. On a side note, for all you 520 bridge drivers. We are watching the Lake Washington Bridges and the wind speed closely. If we get gusts of 50 mph or more we will have to close the 520 bridge. On another side note... We had a little glitch with our server that serves up mountain pass images this morning. For some reason it decided to ask for a username and password to view the images. We gave it a good kick and it's back to normal now, sorry about that. Big plans for the weekend? Holiday parties around town? If you are traveling this weekend, be prepared for some serious winter weather headed our way. Our friends north of the border are sending us the chills. The weather forecasts are showing a cold blast from British Columbia coming down that will bring snow and temperatures down to the daytime 30s and nighttime 20s. And that’s in the Puget Sound lowlands. As you head up the mountains, toward Eastern Washington or down to south central part of the state, we are talking significant snowfall, lows in the teens and highs in the 20s. That’s just plain cold. For drivers, first and foremost, slow down. Ice and snow, take it slow. And, be prepared. Look at our winter checklist of ways to prepare your car for winter driving. There are also some great tips on driving in snow and ice. Bookmark our site to make sure you can get the latest road conditions. We will also be talking to the media to keep everyone up to date. Our partners at Washington’s Emergency Management Department have some winter readiness tips for the home and office. The past two winter seasons also have produced a series of tragic carbon monoxide deaths involving the improper use of generators and charcoal burners for home cooking or heating. Take the time to watch WEMD’s Generator Safety/Carbon Monoxide video at: http://www.emd.wa.gov/preparedness/videos/video_generatorsafety.shtml. Also, it may be a good idea to make sure you know your office, school and daycare snow and ice policies. This time, the real cold stuff shouldn’t start until Friday and we should be back to a normal winter trend by Monday (which still means cool temps and snow in the mountains). But, winter weather is unpredictable and it’s a good idea to have that info handy. We had to close a portion of Chuckanut Drive (State Route 11) near Bellingham for close to two hours Tuesday, Dec. 2 to pull a front loader out of the trees. The loader was driving down the narrow, winding, two-lane road and had moved over to the "shoulder" to let some cars pass, when it slipped and tumbled down the steep hillside. Apparently the driver got a little too close to the edge of the hillside. The soft, steep shoulder wasn't able to support the weight of the loader and down it went. It landed upside down against a tree. The driver was taken to the hospital with minor injuries. You're probably wondering why the loader was driving along the highway in the first place. To make a long story short, there have been a few (four) rockslides on Chuckanut Drive in the last month. The contractor we hired, Granite Northwest, has the loader on the highway to help clean up the slides. The loader had been rearranging a pile of rocks at a dump site and was headed back to the rockslide location when it happened. Wondering about the status of North Cascades Pass? It's still open. Before Thanksgiving, the tall (6 to 8,000 foot starting zone) avalanche chutes were about halfway to where they'd need to be to cause a threat and we haven't gotten much more snow (6 to 10,000 feet) over the last week. The forecast doesn't call for much more for the rest of the week, so until we get some "winter" it's going to continue as it has - crews plowing, etc. as needed. Our forecaster says Washington Pass ought to get another 2-3 inches between now and Thursday, which isn't real "threatening”. Remember that the traditional closure dates are between Thanksgiving week and the 2nd week of December. One substantial storm is really all that is needed to fill those chutes and cause the avalanches that will close it for the season - and it's very likely to happen over the next two or three weeks, but who knows? We have around 14" to 16" of snow on the ground at the summit. A General rule for avalanche danger that closes the highway is 24” to 36” of snow coupled with some additional trigger, i.e. rain or more snow or a big temperature change. When the season closure comes, it usually happens fast, so if you’re planning a trip, check the pass report and the web page (www.wsdot.wa.gov/traffic/passes/northcascades/) before you leave or call 5-1-1. Washington and Rainy are a thousand feet higher than Stevens and two thousand higher than Snoqualmie, so they often get snow when the others are getting rain. Travel numbers from Thanksgiving 2008 show more drivers may have made a weekend out of it. Compared to 2007, travel decreased slightly on the Friday after Thanksgiving, while increased – in some cases close to 40 percent – on the Sunday of Thanksgiving weekend. Prior to the holiday weekend, WSDOT posted information on typical cross-state holiday travel on its Web site and its travel predictions were very close to actual traffic counts for Wednesday through Saturday. 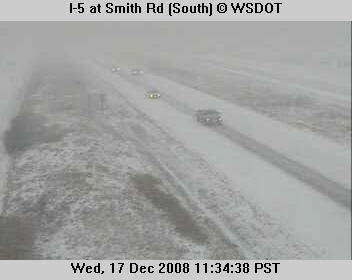 Compared to 2007, many drivers stayed in Eastern Washington over the weekend. On I-90 over Snoqualmie Pass, close to 180,000 made the trip Wednesday through Sunday, an increase from 2007 of just 2,150 vehicles (1.2 percent). Westbound travel was down 12,900 (12 percent) on Friday, but up 25,200 (13 percent) Sunday. Snoqualmie is typically very busy for Thanksgiving. Another busy Turkey Day spot is Washington’s only section of I-5 with just two lanes in each direction - the area just south of Olympia through Lewis County. We have projects going on to widen it. For the entire weekend, close to 350,000 vehicles traveled here (Wednesday through Sunday), an increase of just four percent from 2007. But looking at the numbers from Sunday alone indicate there were 68,600 cars on the road here, 16,000 (30 percent) more than in 2007. Sunday's southbound travel was up 19 percent and northbound travel up 41 percent. Okay, so here’s the big question…why? Forty one percent is a big number – why and what were you all doing Sunday? One thing we do know it wasn’t the weather. It was pretty good all over. Fog and frost slowed Snoqualmie Pass traffic in the early morning hours, however the weather did not cause serious problems or long delays for holiday travelers. By the way, for those who like numbers, it looks like we were right on in Tacoma. On the SR 16 Tacoma Narrows Bridge toll plaza, we correctly predicted between 60 and 75 percent of drivers would use the manual toll lanes during peak travel times (6-11 p.m.) on Thanksgiving Day. It seems five-mile backups were reported at times, with wait times up to 40 minutes. To help these drivers, the Washington State Patrol temporarily opened the HOV lane to all electronic toll payers with Good To Go! accounts. Besides the Thursday rush, there were no backups reported for the remainder of the weekend. Why are there two temperatures listed for Stevens Pass? Where are they taken at? I can see 1-2 degree difference in them but sometimes there is 5 or more degrees difference. There are three temperatures displayed on all of the mountain pass pages. The temp in the yellow "Pass Report" box next to the picture of whatever pass you're looking at is what is radioed in to our various Traffic Management Centers from the thermometer on the maintenance supervisor's pickup. That's the air temperature in the shade on the roadside wherever he or she is when they call in the pass report and set the traction restrictions, if any. As a result, the location could vary a mile or more from the summit, depending on the pavement conditions the supervisor has encountered as he/she makes the assessment. That's a call that takes place every 4 hours from November through March. It means that at 1 p.m., you're looking at a temperature that is an hour old. Below the camera image is a blue box labeled "Current Weather". A road weather information station provides that data every few minutes to the web page. The thermometers measure the air temperature and the pavement temperature at the summit of the passes. These are also subject to the influences of any permanent location - sunshine - a bird perching on a sensor or even a vehicle stopped on top of the pavement sensor. Yesterday, for example, Stevens showed a temperature of 37 for the noon pass report, but by 1 p.m., the current weather box showed an air temperature of 48 and a pavement (surface) temperature of 53. A half hour later, when the sun went back behind the clouds, the temps had dropped to 47 and 51, respectively. The Blewett pass page showed a similar pattern - 42 degrees in the pass report box and in the current weather box, 52 - air, 42 - surface at 1 p.m. I checked Snoqualmie, Satus, etc. and Loup Loup (37-37-37) was the only one that showed all three matching, and then only for about fifteen minutes. You might think we ought to eliminate the temp in the pass report box to eliminate confusion - and we would except that the info in the yellow box is what also appears on several other of our web pages, the 5-1-1 phone system and Highway Advisory Radio's, and NOAA's web site which is what Associated Press uses to provide its member's "news". All of those systems are automated and when conditions do change rapidly, forcing us to change the traction restrictions sooner than the standard "every four hour" schedule, then all of those change, too. It really wouldn't make much sense to update the mountain pass reports every 3 to 10 minutes because the temperature changed a degree or two - and if someone is looking at the pass pages, between the picture, the pass report and the current information, they ought to be able to decide if they want to go or not.